"The whole crew at Capital Mechanical were awesome! We needed a new AC and were worried about the cost. Capital Mechanical was the best price and the workmanship was top quality. Gary had great suggestions for simple ways to get more air flow into our home. Every time our air comes on now we feel so lucky for how comfortable our home is. I would recommend Capitol Mechanical to all my friends and family." 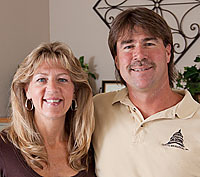 Started in 1988 by Gary Albert, Capitol Mechanical sells, installs and services residential and commercial air conditioning and heating systems, custom fabricated sheet metal products, blown-in insulation as well as seamless and bonderized rain gutters. Based in Citrus Heights, Capitol Mechanical services the greater Sacramento region. Capitol Mechanical is proud to be a Better Business Bureau Accredited Business with the highest rating of A+. We believe this rating reflects our solid commitment to customer satisfaction. When you contact us for a free estimate you will not meet with a commissioned salesperson. Rather, you will meet with Gary Albert, the owner. Gary’s extensive industry knowledge and experience will enable him to accurately answer your questions and ensure that you are provided with the solution that best fits your specific needs. Rheem awards its "Pro Partner" designation to a very select group of elite businesses. In order to earn the designation a business must demonstrate that they operate in a highly ethical manner, are customer friendly, professional, credit worthy. Pro Partner businesses are typically the most highly trained service organizations. If you hire us to do the job, we will work hard to achieve your complete satisfaction. We do this by using only quality products coupled with highly trained professional staff. We know there are many choices when it comes to hiring a contractor and we strive to set ourselves apart by doing whatever it takes to do a quality job right, the first time. We hope that you will give us the opportunity to serve you, and add you to our list of satisfied customers.